This summer is flying by and that is made all the more clear to me by the fact that it is again time for another Secret Recipe Club post. This month I was assigned Amber’s blog, Bluebonnets and Brownies. Amber is a true Texan married to a Brit with a shared love of breakfast tacos (who doesn’t love breakfast tacos???). I had a lot of fun rummaging through her blog and bookmarked more than a few recipes to try. I ultimately narrowed it down to her Cucumber Tomato Salad, Borracho Beans (which I am DEFINITELY going to make), Oktoberfest BBQ Sauce, and Apple Cinnamon Waffles. My son and I decided to go with the Apple Cinnamon Waffles and began the process of making them vegan, gluten-free, and oil-free. The results were fantastic. Apple-cinnamony goodness. In a large bowl, combine pancake mix and cinnamon. Whisk together to combine and aerate. Add the almond milk, yogurt, applesauce, Energ Egg, Sweetleaf Sugarleaf, and vanilla extract directly to the flour mixture. Mix again with the whisk until all the ingredients are thoroughly mixed and incorporated, and you have a smooth batter. Cover the bowl with plastic wrap for 30 minutes to overnight. We prepped the batter at night and put it in the refrigerator until morning. When ready to cook, heat your waffle iron. Allowing it to go through its heat cycle a couple of times will ensure crisp waffles. Fold the finely diced apple into the batter. Cook the waffles according to your waffle iron’s instructions. Wow, I’m going to have to send your post to my pal Nancy! She’s gluten, dairy, and egg free, and I bet she’d love your take on these waffles. Those borracho beans are a must try, friend. SO good! I’ve even made them with gluten free beer, and they were fab. I am so excited to try them with the gfree beer! I love making homemade waffles and I simply don’t do it enough. My kids would love these – they sound amazing! I love that you prepared them vegan and gluten free. Awesome! 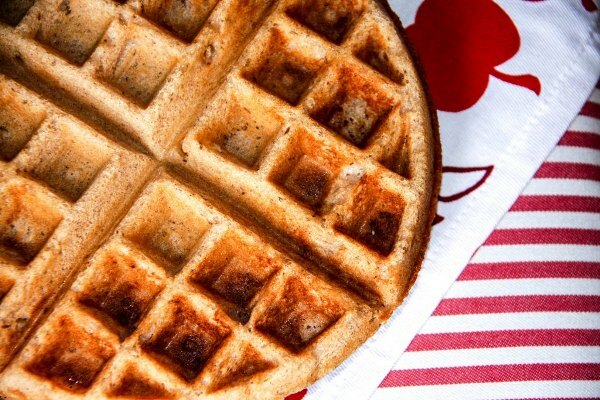 My daughter is allergic to wheat, egg & dairy and would love these waffles, saving this recipe to make for my sweetie girl. I think she will love them! 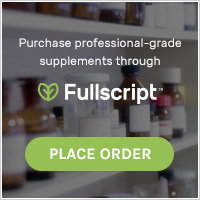 My daughter has the same allergies…along with a soy allergy. What great looking waffles! Love the cinnamon apple twist. These look so good. Nothing like a good waffle in the morning. This definitely looks delish! I will have to make them when I purchase a waffle iron once we move. Could I use the same recipe and make pancakes? These should work as pancakes, though you may have to thin the batter a bit. Let me know how they turn out…happy moving!!! Great-looking waffles! Perfect for fall, which is just around the corner, I’m afraid! 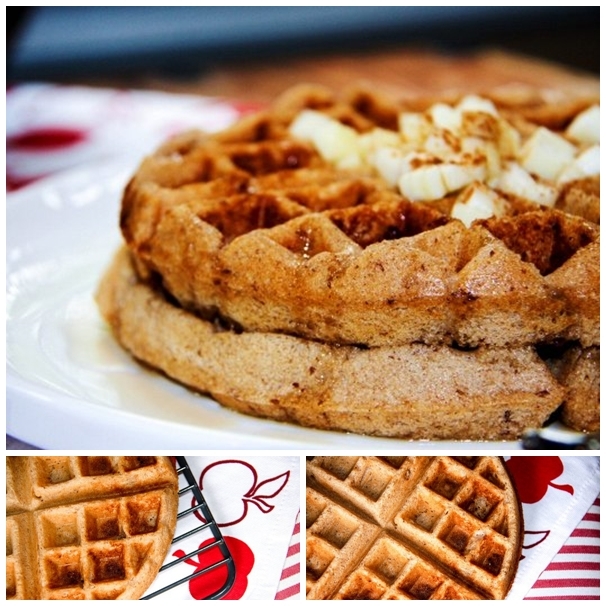 Can’t go wrong with breakfast foods – especially waffles! Gonna have to try this for brunch this weekend =) Great choice for SRC! Mm, I can almost smell the warm spices and comforting aroma of apples through the screen! Come fall, these will be a big hit at any breakfast table.